I recognize the lead photo for this post makes these cookies look enormous. They're not. In fact, one of these cookies is about the size of a half-dollar, and you might be able to fit a dozen of them in the palm of your hand. And while the photo might be a bit misleading, the trade-off is that you can see all the flecks of shaved chocolate, oats, and walnuts that are packed into every tiny cookie. The grains of sugar on top? They give the cookies just the right amount of crunch. 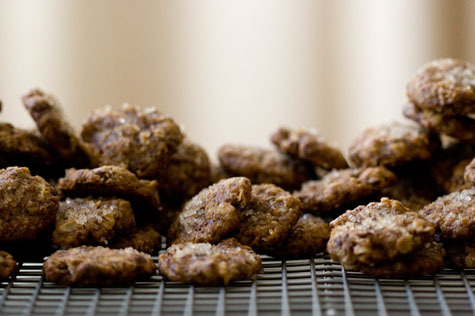 These are the perfect bite-sized cookie, and each batch makes nearly twelve dozen of them. I started working on this recipe over the summer (it took a few tries!). I knew I wanted my cookie to be tiny. I wanted it to be thin, and I wanted it to be golden, crisp, nutty, with plenty of chocolate. I started shaving the chocolate early on, instead of using chips or chunks. 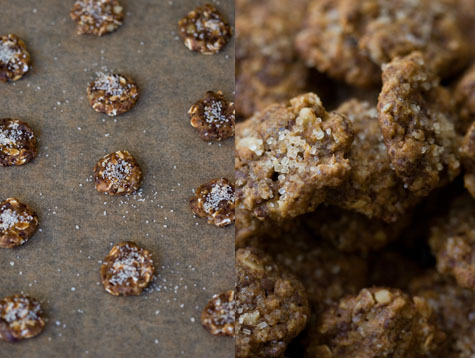 It ended up being one of the things that makes these cookies unique -and it allows you to press the dough near flat. The recipe doubles easily, and I can't resist mentioning that ice-cream sandwiches made with them are tres cute and tasty.